Keep your cells young, healthy, and vital with this dynamic formula of 8 rainforest plants documented with cellular protective actions for the skin, brain, liver, kidneys, gastric tract, heart, and immune system. This product was featured in an article from the Health Sciences Institute. For more information on the individual ingredients in Amazon Vitality, follow the links provided in the plant database files in the Tropical Plant Database. Ingredients: A proprietary blend of calaguala, samambaia, chanca piedra, cat’s claw, fedegoso, picão preto, gervâo, and tayuya.This formula is 100% pure natural ground plants. No binders, fillers or other additives are used. These plants have grown naturally in the richness of the Amazon without any pesticides or fertilizers. 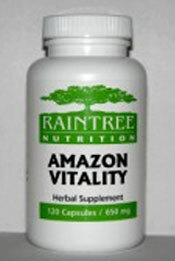 Suggested Use: Take 1-2 capsules twice daily with meals.